A vivid slideshow of photographs with beautiful transition effects is one of the most original ways to display your pictures. What’s better then a vivid slideshow? Watching the slideshow on your TV screen. Showing your slideshows on TV is a creative way to display your presentations for work, or share your personal memories with friends and family. There are several ways to view your slideshows on TV now days, but one of the easiest and most popular is by DVD. 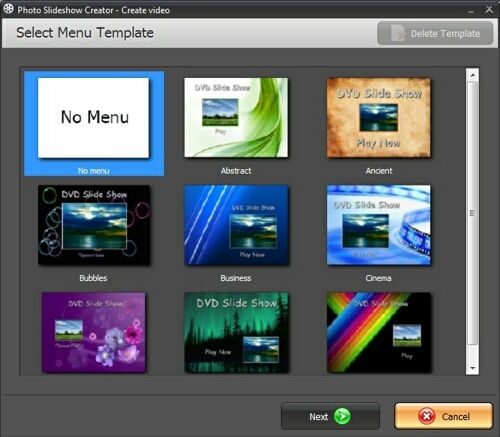 In order to burn your DVD slideshow, use Photo Slideshow Creator program from AMS Software. Our slideshow Editor offers different tools for creating all kinds of different slideshows, like greeting cards slideshows, mini movies, and presentational slideshows. Photo slideshow software has a wide range of capabilities needed to create a vivid, memorable slideshow of your photographs. One of the nice features of this program is the ability to add a large number of images to your slideshows with music and animated transition effects between slides. With this slideshow program you can save finished projects in the form of EXE-file, screensaver or video's for different media players including DVD. You can burn your DVD slideshow right from our program. Burning your DVD slideshow using our software is a fairly simple process. First and foremost, you must create a photo slideshow and save it. The program will automatically ask you to save your project during the video creation process. To burn your DVD slideshow, open the top menu File> Create and Burn DVD Disc. You can also open on top menu Create > Create DVD Slideshow. During the burning DVD slideshow process you can create DVD disc menu, change the background, select the music, etc. Once the burning process is complete, you can view your DVD slideshow on most home DVD players Pal (Europe) or NTSC (North America). With Photo Slideshow Creator program you can not only burn DVDs directly, but also create special DVD folders for preparation of a coherent structure within the DVD burning process. You can also create ISO images.